One of the things that makes DC great is the large communities of people from different regions who love and support their home state as well as DC. Neighbor and reader Sarah Hubbart, along with her husband, Ben, is from one of the areas of California most devastated by the Camp Fire. 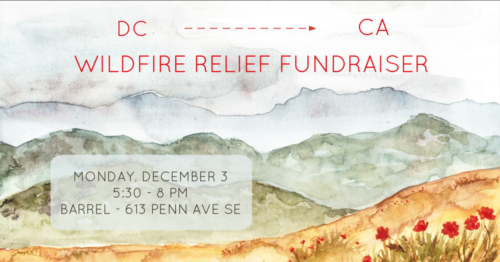 Sarah and Ben are organizing a fundraiser this Monday, December 3, at Barrel, 613 Pennsylvania Avenue SE, to help the relief efforts in their home state. The proceeds from the night will go to North Valley Community Foundation, a non-profit established in 2005 to “mobilizing the inherent good in human beings for the benefit of others and our planet.” In this case, North Valley is helping those displaced by the fire and is involved in long-term recovery efforts. You can read more about Sarah and Ben’s fundraiser and RSVP by clicking here. WHEN: Monday, December 3 , 2018, 5:30-8 p.m.
WHY: Drinking for a great cause is a great way to end a Monday.